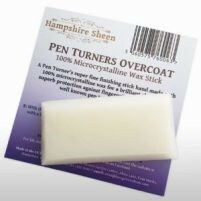 Product information "pen turners overcoat"
A 100% microcrystalline stick for pen turners who enjoy the benefits of this special wax on their turned pens, be them wood or otherwise. It applies over any finish the turner favours to give a fingerprint resistant, glossy shine. Ron Caddy, the well known pen turner uses this product in his own workshop. It goes on smoothly, buffs wonderfully and lasts for ages. The application method is the same as the Hampshire Sheen CarnaCrystalline Stick. Related links to "pen turners overcoat"
Customer evaluation for "pen turners overcoat"